The inner debate inside myself regarding polyamide leggings/trousers has finally come to an end. I'm not that sure if I like them. Hah. But I ran into a pair and didn't let go the occasion. Queen Michelle from Kingdom of Style came to mind immediately. My first impression after wearing them was well, you have to have appropriate weather. A bit chilly if possible, so not to melt away when the sun hits directly. Other than that, I like how smooth they feel, haha. No really, they look and feel very textural. Yes. Oh well. 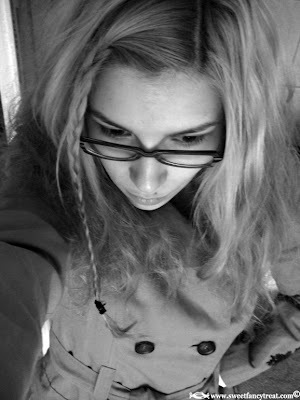 Also, felt like braiding my hair a bit. Now I'm Pocahontas meets Catwoman. Dear. Hey, you got to have some self-humour. I have no idea why I thought Pocahontas had braids in her hair and after googling a bit I couldn't find any... Neither in the original film. Hm. P.S. 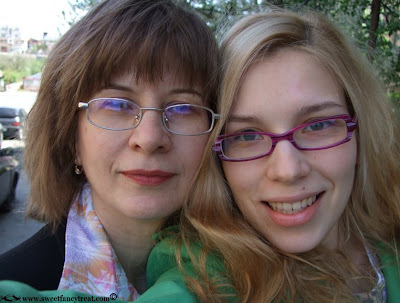 Photo with my mum and me, resembling the one from past Christmas.